From teams, agents to players, virtually the entire NFL universe converges on Indianapolis in the coming days for the 2018 Scouting Combine, which begins Wednesday and runs through the weekend. The Combine remains an essential part of the predraft process for the scheduled 336 draft-eligible participants. And the New Orleans Saints certainly made the most of time spent in Indianapolis last year by getting a good look at draft prospects and eventually turning weakness into strengths, especially on defense. 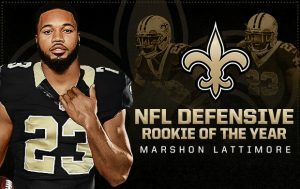 Marshon Lattimore – Rookie of the year. New Orleans Saints CB Marshon Lattimore has been selected as the Associated Press NFL Defensive Rookie of the Year, the first time that a Saint has won the award. Lattimore, the 11th overall pick by the Saints out of Ohio State, enjoyed a standout season as he is the only the fourth cornerback in franchise history to be selected to the Pro Bowl and the first since Eric Allen in 1995 and joined fellow rookie, RB Alvin Kamara as one of only seven Saints rookie selected. The Cleveland, Ohio native started all 13 games he played in and posted 53 tackles (44 solo), a club-best five interception returns for 85 yards with one returned for a touchdown, a team-high 18 passes defensed, a forced fumble and a fumble recovery. Lattimore’s five picks were ranked first among NFL rookies and tied for fifth in the league overall. Posted in Saints News | Comments Off on Marshon Lattimore – Rookie of the year. 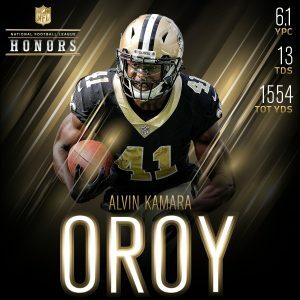 Alvin Kamara Rookie of the year ! Saints running back Alvin Kamara edged Chiefs running back Kareem Hunt as the NFL’s Offensive Rookie of the Year. The award was announced during Saturday’s NFL Honors program in Minneapolis. Kamara, a third-round pick from Tennessee (67th overall), ran for 728 yards and caught 81 passes for 826 yards for 1,554 yards from scrimmage. That total was second among rookies behind Hunt, who led the NFL with 1,327 rushing yards. Kamara’s 14 total touchdowns — eight rushing, five receiving, one kick return — led all rookies. 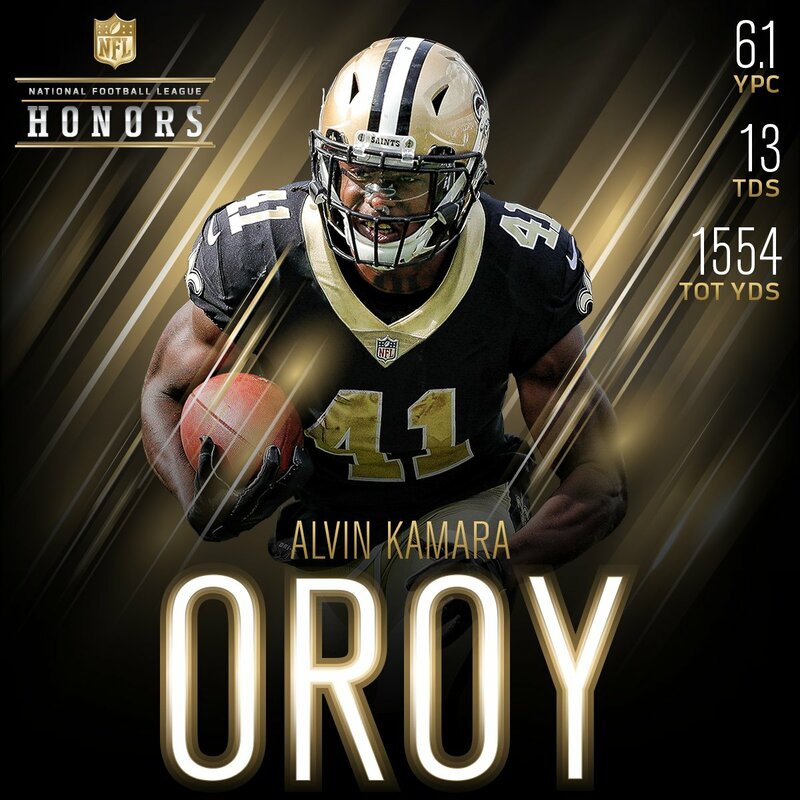 Posted in Saints News | Comments Off on Alvin Kamara Rookie of the year !